I assume this is for the orange wires !! Was listed in Hemmings in March for 225K$. Guess it didn't sell then?? In either event the only real knock on the car is the bench seat, the car appears excellent. so is that a speaker fader hanging under the dash i can almost read it? IT IS A FADER AS MOST 8 TRACK CARS HAD TWO L-R DASH SPEAKERS. Are you sure? From all that I've seen,some do some don't. You have seen the taller small block bracket on a B or RB engine? I have never seen an "a" engine bracket on any b or r/b engine. Is this another one for Mopar John to poll? Yah, that's a TALL bracket. That said, I have brackets on both of my cars. 440 Bird and 383 Bee. But it DOES have the unpainted steel power steering cap! This is what came om my car,bought from the original owner,which is correct ? All of my 1969 model year cars and pumps have the metal cap. 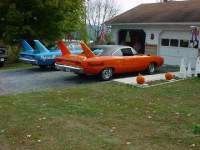 My Superbird and all my 1970 pumps have plastic caps like yours. While were at it thanks for posting the nice picture of your valve cover oil fill cap! 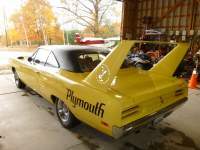 I believe it is correct as I spent a lot of time looking for a nice correct one for our Superbird that didn't seep oil onto the valve cover! It has just the one depression with 4 small spot weld marks. I have attached a picture from my for sale ad with 5 differant kinds that are ALL wrong for a 1970 440. The car that this post is about has one of the rivit variations!